A two-bedroom, two-bathroom stone cottage on a farm in southern Drakensberg. I’m looking to build a two-bedroom, two-bathroom (showers only) stone cottage of about 120m2 on my father’s farm in the southern Drakensberg. I’d like an open-plan living room, dining room and kitchen, and a large veranda. The outer walls will be sandstone-dressed, with possibly brick- or block-plastered walls on the inside. However, I’d like at least one of the interior walls to be dressed in sandstone. The doors and windows should be of wood, and I’d prefer French doors to the exterior. Because the cottage will face north-north-west, the living room area could be placed on the western side for the afternoon sun. The front of the cottage will have a mountain view, so I’d like to have large windows here to take advantage of this. Attached is my basic sketch of something I had in mind. Thank you for the feedback on the specifics of your cottage. 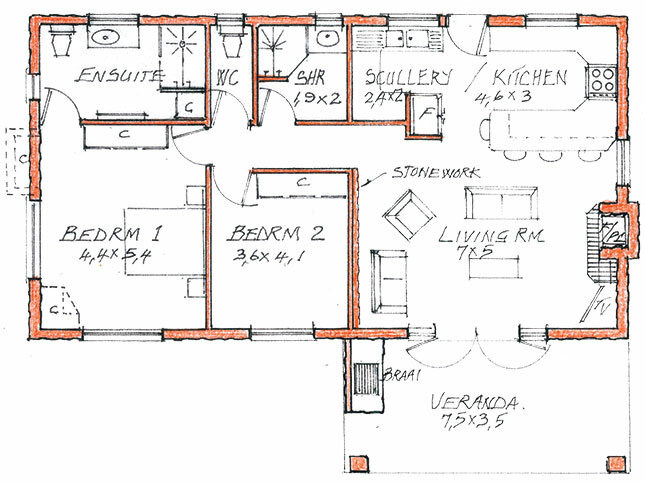 Shown in the sketch above is a layout with slightly increased measurements to your given layout; the walls needed to be added to the room sizes. The wall rockwork of dressed sandstone may come in different sizes, but will resemble the rock facades as shown. Thanks, too, for the chats on the phone. It helps to be told what cost savings are required; I can then design accordingly. The roof styling can be one of many, but with the regular 22° double pitch, as shown, your farmworkers should be able to construct the roof assembly under your direction. With your plans, I’ll include an easy way of building the rockwork. Let me have your further thoughts and I’ll adjust where required. tel 036 352 3178, fax 088 036 352 3178, cell 082 412 4459 or email hillbilly@eca.co.za. Please provide details of the proposed development. Visit hillbillyhomes.co.za.